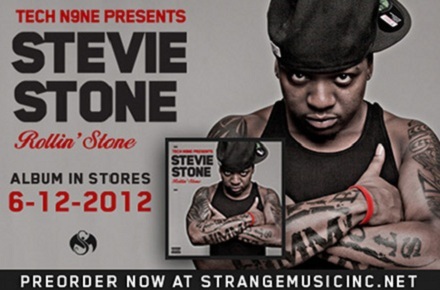 With the release of Stevie Stone’s Rollin’ Stone fast approaching, fans all over the web are putting in their orders for an exclusive pre-order package from Strange Music. The highly anticipated album includes the brand new hit, “808 Bendin” featuring Tech N9ne, and will also give fans a chance to scoop up an exclusive pre-order that includes an autographed copy of the album, an exclusive t-shirt (XL only), a full color sticker, and a bonus free download of the unreleased track, “In The Game”. Giving fans an update, Stevie Stone recently jumped on the web to share this photo of the signed pre-orders for Rollin’ Stone. If there was any doubt before, Stevie Stone is making sure fans everywhere know that he is personally signing each and every copy. Don’t miss your chance to get Rollin’ Stone signed by Stevie Stone himself!